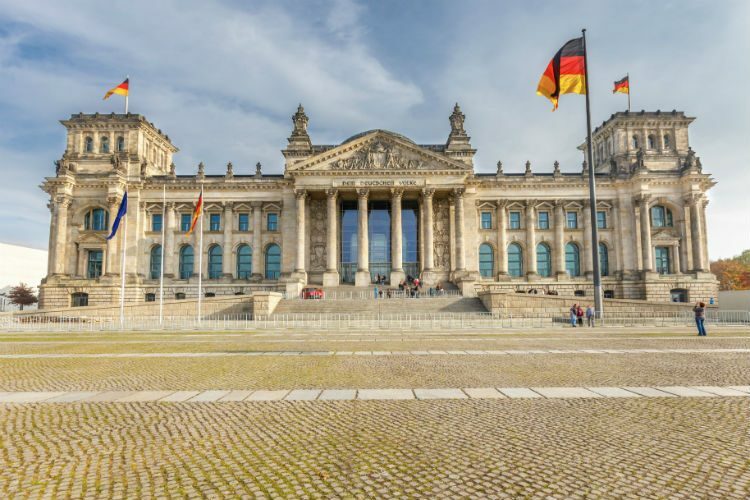 If you’re planning your first visit to Germany, here are some of the most important rules and customs that you should follow. This guest post is by James Cave from This Travel Guide. He has also written a book on German culture called German Men Sit Down To Pee And Other Insights Into German Culture*. Every country has its own cultural quirks and rules that you wish you’d known before visiting. And this is definitely the case with Germany. German culture has plenty of rules that don’t exist in other countries. Having spent more than a year living here, I’ve broken most of these at some point or other. This list contains some of the most important rules and customs that you should follow when visiting. It’ll hopefully keep you from making any of the cultural faux pas that I’ve made, and allow you to make the most of your time here. Jaywalking laws are something that are normally associated with America, but they apply in Germany as well. Here, almost everybody waits patiently for the green man and this applies even if there’s no traffic coming. As with all of the other rules, it’s a good idea to just follow these if you’re visiting. Rules are there for a reason – waiting for the green man is safer and sets a good example to children, for example. And if you break one of them, you can expect anything from a tut-tut to a formal lecture. In Germany recycling is not really optional. Everyone recycles at a level that would put recycling centres in other countries to shame. If you don’t recycle, it’s very likely that somebody will give you an educational lesson on why you should. Although it can take a while to get used to the number of different bins, it’s fairly easy to recycle here. Every apartment will have a row of communal bins for plastic and packaging, white glass, coloured glass, paper, and biodegradables. There’s also a general waste bin but, after you’ve carefully sorted through your waste, very little actually ends up going into that. In many parts of the world, Sunday is a day for shopping or doing a little DIY. Not so in Germany – here, Sundays are seen as a day to relax. With the exception of the shops in train stations, pretty much every shop in Germany is closed on a Sunday. And this includes supermarkets and multinational high street shops as well. So remember to set one of the other six days of the week aside for buying souvenirs. Sunday really is a day for relaxing, and the good news is that you can definitely expect to get that all-important lie-in. Anything noisy, such as power tools, the lawnmower or even bottle recycling, is banned on a Sunday. This isn’t the only time that you should be quiet either. As well as the obvious night-time hours of 10 pm to 7 am, Germans observe a quiet time between 1 and 3 pm. Public holidays are also treated the same as Sundays. So the shops are closed and anything that makes noise is strictly verboten. If you’ve ever had to wait in a supermarket queue while the person in front slowly packs their trolly, you’ll be pleased to know that this doesn’t happen in Germany. The etiquette in Germany is to take all over the items you’ve bought to the packing shelf and organise it there. Things are changing in Germany, but it’s still often very hard to pay with a credit card or a foreign bank card in Germany. Cash is king here, which is quite unusual as most other European countries are moving toward a cashless society. The reason for this is that cards, especially credit cards, are associated with debt. For the most part, Germans avoid getting into debt to the point that a high proportion of adults rent rather than have mortgages. There are a couple of theories as to why Germans have such a strong aversion to debt. Many of these focus on the reparations that Germany had to pay following each of the World Wars. But the reality might be much simpler. Debt is a bad thing and, as Germans are quite rational people most of the time, they avoid getting into debt or making it easy for others to get themselves into it either. So, when in Germany, make sure you carry cash on you as there’s a good chance you won’t be able to pay with a card. In Germany, men sit down to pee and, yes, this rule is enforced. If you’re visiting someone’s house or using the toilet at a restaurant or cafe, remember to put that toilet seat down. You’ll see signs up in restaurants and cafes reminding you of this, and some German inventors have even created a gadget that shouts at you if you leave the seat up. This gadget comes in many different German celebrity voices, including Angela Merkel’s. As with everything else, there are plenty of theories circulating as to why this is such a big deal in Germany. Germans don’t really understand why this is seen as so bizarre, though. To them, it’s just more efficiently hygienic. And, in a country that places a high value on efficiency, what else is there to discuss?